Aksel Hennie Recruited For Hercules | Radical Studios, Inc.Radical Studios, Inc. 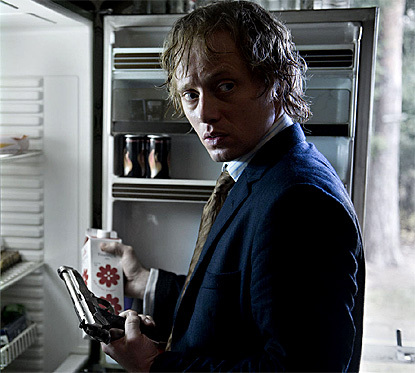 He made a splash – in more ways than one – in last year’s excellent Norwegian thriller Headhunters as Roger Brown, and Aksel Hennie has well and truly stuck Hollywood’s radar. He’s now landed a role on Brett Ratner’sHercules. The film, adapted by Ryan Condal and Evan Spiliotopoulos from Steve Moore’s Radical Studios comic, will see Dwayne Johnson as the legendary demi-god. Only, um, without the demi-god bit. In this story, Hercules is a mortal, albeit powerful man (come on, he’s being played by The Rock, it’s not like he’s a wimp) who agrees to help the Thracian king whip his army into fighting shape. But the task is not as easy as it first sounds for our hero and his men. Hennie will bring some of his on-screen energy to Tydeus, a warrior who is devoted to Hercules, is known for swinging twin axes and is apparently such a lunatic that he has to be chained up at night, lest he cause chaos while he sleeps. Ratner is gearing up to shoot this year for an August 2014 release date. It won’t actually serve as Hennnie’s English-language debut, however: he’s already shot a role alongside Morgan Freeman and Clive Owen in the action adventure tale The Last Knights.